I’ve always said truth is stranger than fiction, but fiction can sometimes dig into that truth a bit more clearly. That’s why I write fiction inspired by real life. 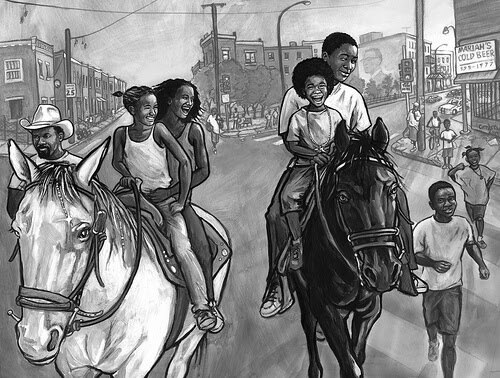 My newest book Ghetto Cowboy, illustrated by Jesse Joshua Watson (Candlewick, August 2011) began when a series of arresting photos in LIFE magazine literally stopped me in my tracks. The article showed a neighborhood in the worst part of North Philadelphia—an inner city rife with gang violence. But this wasn’t your ordinary low-income neighborhood. Black cowboys in the ‘hood? Really? But there it was. The photos showed generations of horsemen, from elders to kids. Apparently, this had been going on for decades. In the early part of the last century, many of the best horse trainers and jockeys on the east coast were black. When a horse was no longer earning, it was either put out to breed or put down for slaughter. Some of these black trainers, who’d grown to love these animals, started taking them home instead of letting them die. They kept the horses in back yards and make-shift stables. When that proved too difficult, they began to lay claim to long-abandoned public land that the City of Philadelphia wanted nothing to do with. Their neighborhood was considered so beyond help that when the City built a freeway, it passed over the neighborhood with no exits. So the horsemen turned that wasted land into stables and corrals—places where the elders could pass on their traditions by teaching the young’uns the art of raising horses. When gangs took over the area and the neighborhood took a turn for the worse, horses became a way of saving lives. By getting boys interested in raising a horse rather than killing another human being, these cowboys gave the youth something positive: father figures, focus, and the ability to stand tall. Well, suffice it to say, I was amazed that I had never heard about this unique subculture of American life. Even people in other parts of Philadelphia didn’t seem know about them—until they became news. A few years ago, the city, like a lot of big metropolitan areas, became interested in gentrifying the neighborhood and taking back that neglected public land for new development possibilities. All the big cities were doing it—when the hipster classes moved into blighted areas because that was all they could afford, the money soon followed. But what the City didn’t realize was that they were up against cowboys who wouldn’t back down. They had a battle on their hands, and that became news. The horsemen had squatters rights—they’d occupied the land for so long, they had a claim on it. The City had no option but to get them on supposed health and safety violations, performing dramatic raids for the media to prove these guys were a danger to the animals. The allegations proved to be false, but not before they began tearing down their homemade structures. The horsemen fought back, proving their love and loyalty to these animals and their culture, but with little money and no one representing their cause in the media, it became a losing battle of attrition. And so, even as the good fight continued, the tradition was slowly dying. It seemed like a modern-day western to me: cowboys vs the land barons, the good guys struggling to defend a way of life against the oncoming modernization of a city. And in the middle of it, black men acting as family, spreading values and traditions in the only way they knew how: the Cowboy Way. I knew immediately that I needed to write about this. It was too vital a culture to let pass unnoticed. The story came quick to me: a young boy abandoned on the doorstep of a father he’s never known—a black cowboy. The boy, Coltrane, feels alone and trapped in a world he’s never seen before. Scared and searching for a way to get back home, but unwanted by both the mother who left him and the father forced to take him on, young Coltrane struggles to find his footing in a world filled with stirrups. 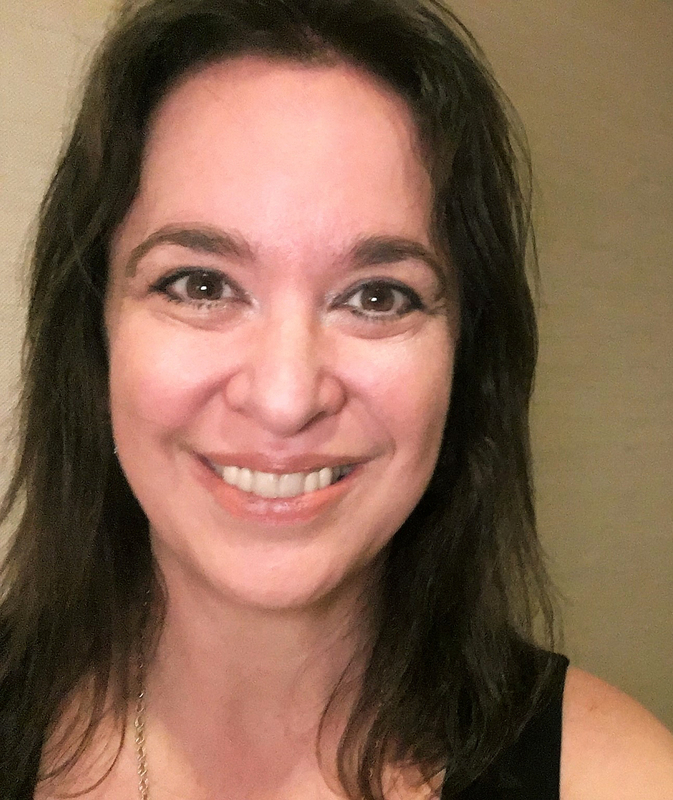 But with a lot of digging online, from articles to local message boards and blogs, I started to make connections, and started to find out the truths and details of this hidden world. My main character, Coltrane, became my eyes into this world. He was a fish out of water, and so was I. Every new revelation, I experienced through him, and together, we slowly found our way. I’d been wanting to write kind of a timeless father-son story, particularly one where an animal helps to bring them together. With Ghetto Cowboy, I think I achieved that. After writing a few stories where the fathers were less than noble and often absent, it was nice to have a story where the father was a role model (though reluctant). Recently, I looked through my list of favorite teen novels, and I didn’t see any books with these elements. It’s about time we showed the positive power of having an older male figure in a young man’s life. This book has been an amazing experience for me. For once, everything seemed to fall in place. When I finally visited the real neighborhood in person, it felt like I’d just walked into my own novel. I knew who a lot of folks were, along with their stories. And here they were, living and breathing, like the characters who’d been dancing in my head all this time. Sometimes a story ropes you in and doesn’t let go. In this case, I was more than happy to go along for the ride. Ghetto Cowboy has been named a Junior Library Guild selection. See photo 1 and photo 2 of the community featured in the story. Enter to win a signed copy of Ghetto Cowboy by G. Neri (Candlewick, 2011)! To enter, share your best close encounter with a horse or discovery of some true life event that inspired you to write about it. Comment at this link or email me (scroll and click envelope) and type "Ghetto Cowboy" in the subject line. Deadline: midnight CST Aug. 22. Note: Author sponsored; U.S./Canada entries only. 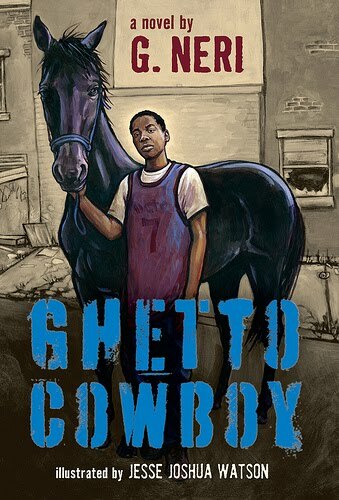 Check out the book trailer for Ghetto Cowboy from Candlewick Press. 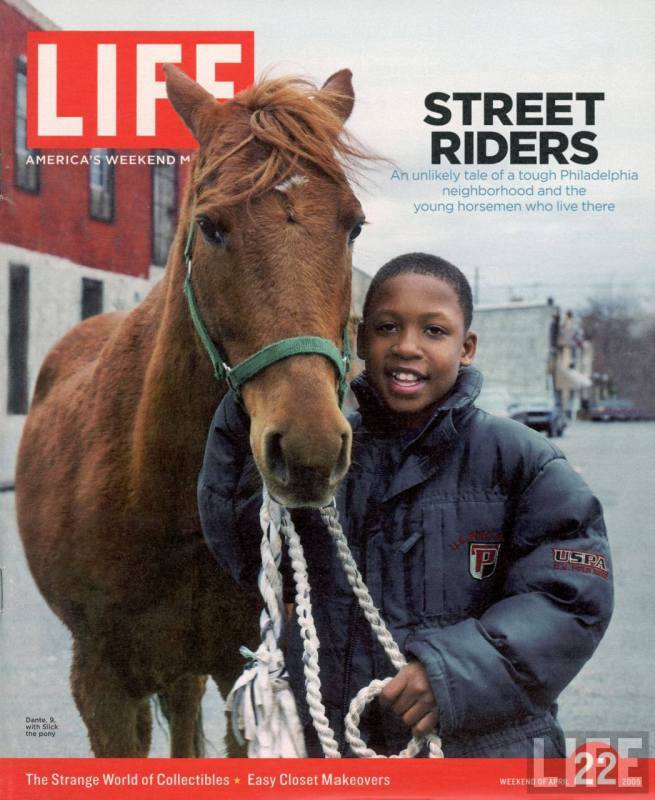 The video below is: This American Life: Horses in North Philly. This sounds like a great story. I have loved horses for as long as I can remember. Unfortunately lessons were not and are not an option for me, so I collect horse models instead. I think the experience that I remember the best was a group ride up a local canyon. Not only was it fun to ride, but the scenery was great to. I am writing this comment with a few tears in my eyes. What an amazing and beautiful story! I grew up in the country about 45 miles from Philadelphia, but both my parents were born in the city. My sister and brother each managed to get a horse, and I, being the youngest, rode these hand-me-down pets. I attended Temple University in North Philadelphia and taught school in that area of the city until my husband decided to become a farmer (cowboy? 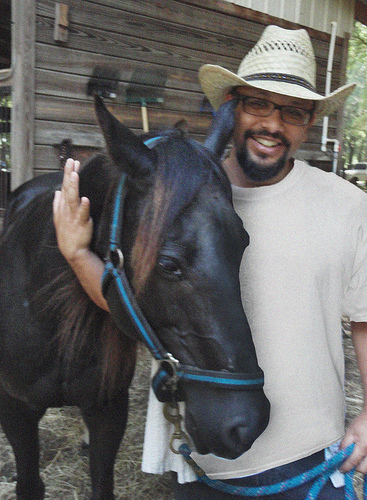 ), and we moved to the Midwest where we owned horses for our seven kids to ride. The kids are all grown up, and the last horse turned 30 this summer. I was just out in the field with him. The vet is coming tomorrow to check on a sore hoof. We don’t think our old boy will make it through the winter, but he has fooled us before. I’ve written a collection of horse stories, A Horse for All Seasons, published by Boyds Mills Press and used bits and pieces of my horse-related experiences in each of the twelve stories. 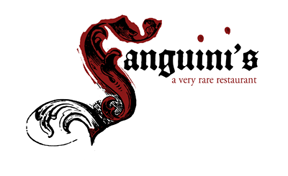 Thanks so much to both G. Neri and Cynthia for this guest post. Great post and what a wonderful story. A few years ago when doing research for a film script I learned about the wild horses of Montana and how they are rounded up by the Bureau of Land Management to make room for cattle ranchers' herds. My desire was to bring their story to the screen, but alas it never went into production. 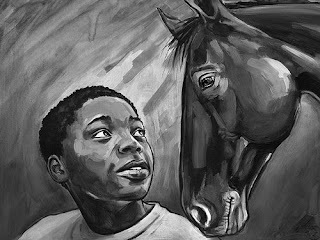 I think about those horses often though and hope someday more will hear about their plight. Fabulous post. Thank you both for a great peek into this fascinating, little-known subculture. I look forward to reading the book. I grew up on a Quarter Horse ranch where all my free time was spent training and competing in horse shows. I spent so much time with my horses, both "working" and playing, we could practically read each other's mind. To say there was a bond would be an understatement. But, in my travels through the horse show circuit, other barns, rodeos (which I don't care for) and other venues, I also was exposed to a great deal of brutality that broke my heart. 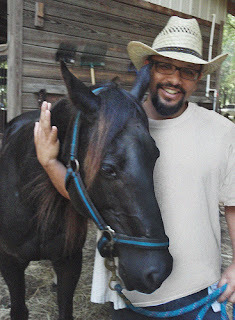 Several years ago, I discovered an obscure slice of American history involving a former slave who taught his horse remarkable skills using only kindness and patience as his training tools. Despite the time of great racial tension, they became the face of the emerging humane movement, proving the power of kindness. I knew I had to write about them. Today, I'm in the revision process for an interested publisher. What a wonderful, touching story! I coudn't take a chance on the contest, I had to order my own copy of GHETTO COWBOY immediately. Happy trails! Wow, what a fabulous story! One I would love to share with my daughters.